There's a new challenge up at The Card Concept and Simon Says Stamp Wednesday Challenge. The image on the left is our inspiration for the theme of "Love & Romance" at The Card Concept and Simon's theme is "The Color of Love". 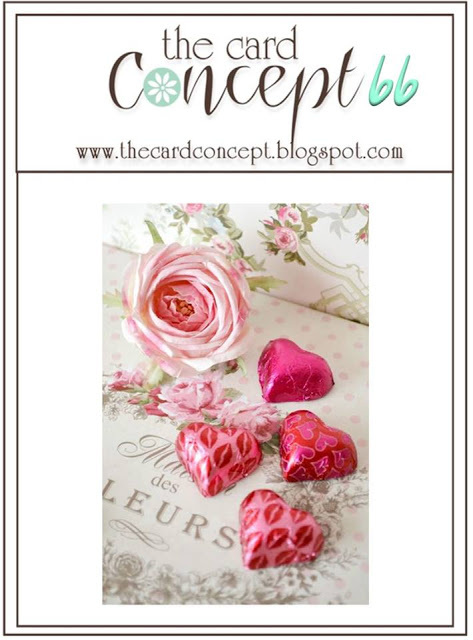 I never need an excuse to use pink, but I do love to incorporate it into Valentine's Day projects. Since I enjoy making cards so much, I love having all types of cards ready to go for each occasion and Valentine's Day is no exception. I love the colors in this particular inspiration image and I wish I had a scrapbook store nearby so I could peruse the paper section for some paper that looks similar to this. It's got the French Country look to it and that's a style I love. For today's card, I started with a top folding card base made from Stamper's Select White. The Silver and Pink Paper is a sheet that found at Michaels in Dallas when I was there at Christmas. I only got one sheet because I tend to use a lot more gold than silver, but I think this is so pretty and elegant and I knew it would make a pretty card for just the right person. The hearts are cut from an Accucut die that I have had for a number of years that cuts and embosses at the same time. I cut these from Silver Cardstock and Lovely Lady Cardstock. The sentiments both came from the Hero Arts Love Stamp & Cut Set. I used Stick-It on both sides of a piece of White Fun Foam, then added the silver cardstock to the top of one side and die cut the whole thing to get the thick word die cut. I'm still not very good at working with Stick-It so I consider this more practice. The small little sentiment on the pink strip is the only stamping I did on this entire project. I used Versamark with Detail Silver Embossing Powder. Once I had the card put together I added some Sparkling Clear Sequins from Pretty Pink Posh. The ones I have are a mix of sizes in 4, 6, 8 & 10 mm all in one package. This card was easy to put together once I decided on how I wanted my design to look. It was simply a matter of die cutting and assembling. Thank you so much for coming by today and checking out my project. I love this theme so I hope to have time to make a couple more cards for this challenge. I'm thinking I need to make another of these for a young lady who is getting married in May of this year. If you'd like to leave a kind of encouraging comment, I do read each and every one of them. So rich and beautiful, Vicki! Love the way you showcased the gold and pink in this delicate design! So glad that you join the fun over Simon Says Stamp Wednesday “The Color of Love” Challenge! Super work! Love, love, love this card! That paper is gorgeous,I'm going to have to go check for it at Michael's! Was it open stock paper or from a pad? And that heart die is the prettiest I've seen, would you mind sharing who's it is. I so enjoy work, always so feminine and pretty. Thanks for sharing and always inspiring. It was in Michaels Open Stock Paper. I only got one sheet but I might need another when I go back to Dallas. I live in the Tulsa area and all of the Michaels here don't have near the selection as they do where my daughter lives. The heart die is an old Accu-cut die that I've had for about 15 years. Birch Press Designs has a few very pretty ones. Simon says stamp carries them. Hi Vicki, thanks for getting back to me. I haven't seen anything like that in my Michaels, but to be honest I've got enough paper for me and 100 other crafters so I've not looked at open stock paper in at least 6 months, lol. I may have to go take a look though, it's the prettiest paper I've ever seen. I live in NJ and this state is horrible as far as crafters go so My Michaels has like max 4 isles for card/scrapbooking:( That doe is just gorgeous, it figures you know when you like a dress or a purse they never have it, lol. I'm off to check out your suggestions, they both have beautiful dies, your right. Thanks for the tip and always inspiring, I really love your work, always gorgeous. Don't always get a chance to leave you some blog love but know I always take a peek and admire it. This is so beautiful and elegant Vicki. The three die-cut and embossed hearts match so well with the gorgeous background paper. Vicki, this is so gorgeous! I love the gold foil heart! It's the perfect touch in your pretty, romantic card! Thanks for joining us at The Card Concept! This card is spectacular! I love what you have done with the background paper and the hearts! Wow, this is absolutely gorgeous! Love that beautiful background paper with the gold foil heart and die cut sentiment- so elegant and perfect for many occasions! Thanks for playing along with us at The Card Concept- hugs!! That is some gooooorgeous paper. Love how it's slightly shabby and has all that gold glimmer. Thanks for linking up your work at The Card Concept! Oh, this is fabulous. The shimmer is just stunning.